Your family IS your job! Although workshops are available on a variety of family themes and tailored to your group’s particular need, following are some of the most popular ones. Length ranges from one hour to a full weekend. Workshops include input, interaction, private/couple/family time, and a good dose of fun. Participants not only learn from the leader but also from each other. For religious groups, content will integrate this dimension throughout the workshop. For secular groups, content will focus on more inclusive values that are common to all. To check upcoming workshop locations and dates click here. Groups may want to schedule additional workshops while I'm in your area. Marriage workshops are often done by Susan with her husband, Jim, and are designed for couples to attend together. Is this the right partner for me? – Is This the Right Life Partner for Me? Deciding to marry is an awesome life choice. Programs and couple coaching are available to help engaged couples explore all dimensions of their relationship to confirm their decision to marry. Inventories such as the Myers/Briggs and FOCCUS are used to guide discussion. Marriage preparation can be done either with groups of couples for a church or with an individual couple. 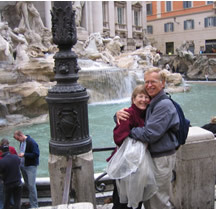 Susan and Jim have been doing marriage preparation with couples for over 30 years. to recapture romance; but it's nice. Learn the seven traits of a Christian marriage and how you may already be intuitively using many of them. This workshop helps couples see the sacred in much of their ordinary life plus explores different styles of prayer and spirituality in marriage. Often you ARE right. More often, it doesn’t matter. Through use of the Myers/Briggs and other personality inventories couples come to understand why their spouses do things the way they do and why it might be right for them. Participants have nick-named this workshop, “Save Seven Years of Arguments”. Using interactive techniques, this workshop deals with the sub-topics of non-verbal communication, listening, sharing feelings, fighting fair, and affirmation. These are the basics of healthy and insightful communication between any two people, but especially married couples. Marriage is work but some of the work can be fun. Humor adds to our “marriage emotional bank account.” It allows us to tolerate offenses that otherwise irritate us. We become willing to overlook minor annoyances because the overall fun and positive experiences we’ve had together outweigh the problems. Learn five ways to nurture humor in you marriage and one way that humor hurts. • Preparing Couples for Marriage across the USA – What’s Changing, What’s the Same? The culture is changing but marriage in the Catholic Church is still a permanent commitment. Susan Vogt has just completed a compilation of marriage policies from across the USA for the USCCB. Learn what the best practices are and where to go for specialized help with thorny issues like cohabitation, mixed faith marriages, ethnic considerations, and liturgical practices. Parenting Workshops can be for parents alone or for whole families. Push together or you'll pull apart. Based on Raising Kids Who Will Make a Difference, this workshop addresses how families deal with issues of Integrity, Busyness, Materialism, Ecology, Media, Sexuality, Fighting, Global Awareness, Diversity, Service, and Faith. Learn 10 Take Home Nuggets to simplify and enhance your parenting with children from 1 to 18. It will be interactive and practical with enough inspiration to remind you why you so wanted to be a parent. This workshop ranges from giving "techno-peasants" the basics for healthy use of the internet and cell phones, to supporting modern parents as they discern reasonable limits to their children's hunger for more tech time. This workshop can also be geared to pastoral ministers who want to use social media, websites, and email blasts to further their ministry. Learn the basics of having a successful family night ranging from having everyone at least stay home on a given night to using it as an opportunity to explore family values and faith. Photos are nice but common experiences make memories that families can carry with them throughout life. Learn “How to Start an Argument” and also how to end it. Explore the Family Pledge of Nonviolence and how it could help your family work out problems more peacefully. Find out the “4 C’s” of resolving family disputes. Learn another language in five minutes and become a multicolored person, a “Rainbow People”. Your Family Is Your Job. Is your family on a bullet train? Most families want to simplify their lives – for the sake of sanity, the environment, and justice to the rest of the world. Most families wonder if they’re doing enough or how to do better. This workshop doesn’t pretend to save the world but it will give you some practical next steps to take – one at a time. Family meetings can be a wonderful tool to make decisions that everyone can live with. BUT, there are traps. Learn three ways that they are often sabotaged and how to remedy it. Based on the values covered in Raising Kids Who Will Make a Difference, this workshop will help parents and educators deal with the issues of self-esteem, time, materialism, ecology, the media, morality, peacemaking, diversity, and service as dimensions of a living faith. – Learn how to start an argument and how to end it. Use the Pledge of Nonviolence to change the culture of your school, class, or family. Learn how to stop nagging by “running a race” and to cure gripes by taking plenty of vitamins B and C. It’s not magic; it just takes planning, know how, and courageous parents and educators. 1. What can a box of band aids, a tent stake, and a whoopee cushion teach about the sacred in the ordinary life of a busy family? 2. When does a church not look like a church? 3. How can you build a family altar without using wood or nails? Learn the joys and pitfalls of having family nights and family meetings while building your domestic church. You tried your darndest to raise your children to be moral, successful, and faithfilled men and women, BUT sometimes you wonder if you did enough. They may no longer be going to church. They may be having difficulty finding a mate or keeping a marriage or job together. How can you help? When do you need to leave them alone? How can you best support them in their new stage of life? This workshop will draw upon the research and insights from Parenting Your Adult Child: Keeping the Faith (And Your Sanity). Click here to read a St. Anthony Messenger article which summarizes the book. – It may be that you look around your home and realize that you have more material stuff than you actually need. – Or maybe your To Do List is out of control and you need to clear some time in your life to be more present to those you love. – Maybe it’s technology that has taken possession of your time and attention. – You may be carrying burdens of worry, guilt, or anger. – Perhaps your burdens are altruistic like wanting to further world peace, a more sustainable environment, or reducing poverty and injustice. – Perhaps some days it just feels so overwhelming and impossible for one person, or even a group of committed people, to make a difference. Walk in another's shoes today. Going to church is good. Saying prayers is good. 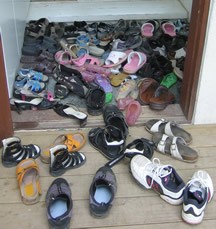 But sometimes families miss God’s presence in the ordinary tasks and conversations throughout the day. Explore the values that undergird your family and how to be gospel people in the midst of a changing world. Take a fresh look at Advent/Christmas, Lent/Easter, Birth, Marriage, Death and other Transitions. These are times when God breaks into our lives in unique ways. Make Christmas more than about gifts, Lent more than about suffering and special days more meaningful. Make traditional prayer forms like grace before meals and bedtime prayers come alive. Memorized prayers may be the beginning but not the end of your family’s spirituality. Deepen your family’s awareness of the presence of God in the ordinary days of your life. Sometimes leaders need to be bold and to take a group where they would rather not go. For example, civil rights leaders called us all to equality before our society and even our churchers were ready to accept it. More often, however, good leadership is done from behind and involves mega doses of listening and empowering others. Leaders grounded in a healthy spirituality know how to persuade and inspire rather than dictate and rule. Authentic power comes from the assent of those willing to follow a compelling vision put forth by a person who embodies it. Nonviolence is not just about refraining from a fist fight or shooting someone. This workshop draws from the insights of active listening and Marshal Rosenberg's work on Nonviolent Communication. This workshop is based on the Myers-Briggs Type Indicator and other personality inventories. It’s geared to helping participants know themselves better and understand that many conflicts between people are not a matter of one being right and the other being wrong, but rather reflect the differences in human personalities. • See also the Living Lightly workshop under Spirituality. • Keeping the Minister’s Family Sane and Holy – What does it profit religious educators, family ministers, or youth ministers to gain the adulation of all the families in their care but lose their own family? This workshop deals with strategies to keep a balanced life in service of the Lord so we can live to serve again. Based on the work of Rabbi Ed Friedman, the insights of family system theory can help ministers in their own families and with the families they serve. Includes sessions on family spirituality, the dynamics of change, the family life cycle, use of the genogram, sculpting, and partnering for effective ministry. Developed by the National Association of Catholic Family Life Ministers. This is a process for energizing groups developed by Harrison Owen. If you're tired of wasting time at meetings and find that the most stimulating conversation happens during the coffee breaks at conferences rather than in the lectures, this may be for your group. Learn how the Law of Two Feet allows "Bumblebees" and "Butterflies" to make the best use of their talents and their time. Traditionally organizations have tended to solve problems by focusing on the problem and trying to fix it. When a group focuses only on what is wrong, however, it can start a downward spiral which overlooks the strengths of the organization. The goal of Appreciative Inquiry is to search for the best practices that already exist, amplify what is working and focus on life-giving forces. This not only boosts morale but gives energy to build on the group's strengths. Susan has been married for over 30 years to Jim Vogt. 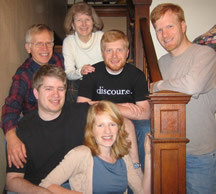 They live in Covington, Kentucky and have four young adult children. Susan has worked in family life education and been a consultant with the Parenting for Peace and Justice Network for over 30 years. Her work has included designing and leading marriage preparation, marriage enrichment, parenting, and leadership programs. She has also worked as a family counselor and has taught high school and college marriage courses. Currently Susan is a freelance speaker, author, and relationship coach in the areas of marriage, parenting, and spirituality. 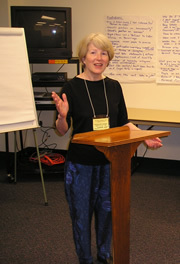 She is editor of the Journal of the National Association of Catholic Family Life Ministers (NACFLM). •Certified Couples Communication leader by Interpersonal Communication Programs, Inc.
Susan has spoken to groups across the U.S.A. as well as in Japan, Kenya, Korea, India, the Philippines, and Guam. Although a committed Catholic, Susan is also committed to helping others find and deepen their own spirituality wherever the Spirit may lead. She is a vowed member of the Family of Mary, a lay branch of the Marianist religious order. She has helped found two lay Christian communities and is currently co-leader of Anawim, a Christian community in the Catholic and Marianist tradition. Our 15 years as Co-Directors of the Family Ministry Office of the Diocese of Covington, KY gave us experience in job sharing. We split one full time job between us allowing one of us to be home with our children while they were young. This gave us a foot in both worlds. We have founded or led lay Christian communities in Cleveland, Kalamazoo, and Cincinnati. We both currently work out of our home. Piecing together our many professional and volunteer jobs has been fascinating and fulfilling work. 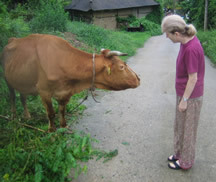 In our spare time we love to contradance and visit our children who wander the world. To see a list of upcoming workshop dates and locations, click here.